I’ve been a homeschooling mom for 20+ years. I’ve homeschooled three children all the way through high school, and my youngest child is 5-years-old, so I still have a long way to go. The truth is that sitting in one room with 30 people your own age all day is not reflective of the “real world.” I want my kids to connect and interact with ethnically diverse people, of all ages, as they will throughout life. Through homeschooling, they interact with siblings, neighbors, kids on community sports teams, and friends of all ages in our ethnically-diverse church. They also spend hours each day with my 86-year-old grandmother who lives in our home. This is true socialization. I want my thoughts, opinions and values to matter more to my children than those of other kids, their teachers and society. Teachers are wonderful. I love teachers, but many times their thoughts, values and opinions aren’t those of our family. I want my children to learn godly principles while they are young so they can build a strong foundation for the rest of their lives. The greatest way to teach my children Biblical principles is to model godly living for them, and I’m best able to do this when we spend time together throughout the day, instead of limited hours at night or on weekends. I want time with my children: learning, playing, laughing, disagreeing and forgiving. Friends will come and go through life, but our children will have their family forever, and I want these relationships to matter most. My kids need their parents more than they need their peers. They need their siblings more, too. I want to follow my children’s unique learning paths, not ones set up by a state office somewhere by someone (as well meaning as he or she is) who doesn’t know my children, their interests, or their talents. I want to choose resources that will provide a well-rounded education with learning methods that will excite my kids! God gave me these children during a limited amount of time on earth. Someday I will stand before God and be accountable for my choices for them. I take this seriously. I want to be able to tell God that I gave my children (and Him!) everything I could when I had the chance. We all know that bullying is a huge problem, and I don’t want my children to be exposed to hurtful or negative words and actions displayed by hurting and negative kids. I want my children to be confident in the people who God created them to be without other kids criticizing them or putting them down. I want their confidence to come from their skills, character and talents and not because they dress or behave in a way deemed cool or popular according to the trends of the moment. I want my children to develop a love and excitement for learning—not just get items completed and marked off a list. I want my child to learn for the joy of learning and not for a standardized test. I want this joy of learning to carry through life! I want the material we use to be interesting and engaging, but even more important Christ-honoring and Christ-centered. I want to trust the beliefs and standards behind those who write the material my kids will use. Homeschooling is about so much more than just books. It’s about household management, cooking, nature, being creative, exercising our bodies and serving others. Every day we learn at home, and interact in life together in healthy ways, my children are learning how to prepare for life. We don’t homeschool in a bubble. Our family serves teen moms in the inner city. We visit city parks, museums, libraries and our city pool on a weekly basis. We meet friends for events and play dates. My children aren’t confined to one room all day, they experience the real life in the real world around them. We can sleep in when we need to or take vacation days when everyone else is in school. We can spend time with dad during his lunch hour (both my husband and I work at home), and who him our school projects as we complete them. I’m not foolish to think that I can provide everything my child needs. I also strive to surround my children with other godly adults (our friends, fellow church members, and follow volunteers) so my children can see how others serve Christ, too. My children spend hours outside each day running and playing. They enjoy healthy meals—all of which are eaten with other family members around the dining room table. They eat far more home-cooked items than fast food or processed food. My children also get plenty of sleep, and my younger kids nap during the day, because sleep is important to development and growth. I believe in my children’s future, and I have faith that God is going to do great things with their lives. This faith causes me to put my needs and desires on the back burner for what I feel is God’s greater good for my kids. My faith keeps me going even on days that are hard or exhausting. It’s trusting in the good future for my kids that I can’t see. And trusting in a God who knew and designed their lives before even one of my children came to be. How about you? Do you homeschool? I’d love to hear WHY! What’s going to happen when they go to college? The professors are not going to cater to your child’s needs. A professor may have have beliefs different than yours. They are not going to accommodate their syllabus to meet your child’s needs. I was a public school kid. Unfortunately for me, my mother’s nerves couldn’t handle a crying 3/4 year old who had trouble writing. Both then again it was 1985. Candace, a lot of colleges are actually seeking out homeschool kids because they have a better work ethic. They are more independent and set goals and reach them. As for the professors having different beliefs, that will also happen with public school kids. Homeschool kids being at home does not make them more sheltered. As a matter of fact, my children learn more about real life because we are out in the community volunteering in real life situations, rather then sorting in a classroom. Every one has an opinion, and yours is valid for you, but don’t just assume that that means that homeschooling is a bad choice. Especially when you have no experience with it. Hi Candance! I just had the chance to read your comment. I wanted to share that I was homeschooled all my life, right through highschool graduation. Then it was time for college. I was a little anxious about how I’d so, but my mom assured me that I well prepared. Apparently many universities have a high regard for homechool students because of their solid education and their ability to study independently, which most high school kids are not prepared for. College is very, very different from middle schools and high schools. I’m not sure why this is so, or if it’s always been that way; it would be interesting to hear the different experiences of those who have attended public school, private school, etc. Also, even though it was my first time being officially in a classroom setting every day (I had taken certain “umbrella” program classes while homeschooling) I did very well and was on the Dean’s List my freshman year. This really confirmed for me that my Mom had done a great job homeschooling us! 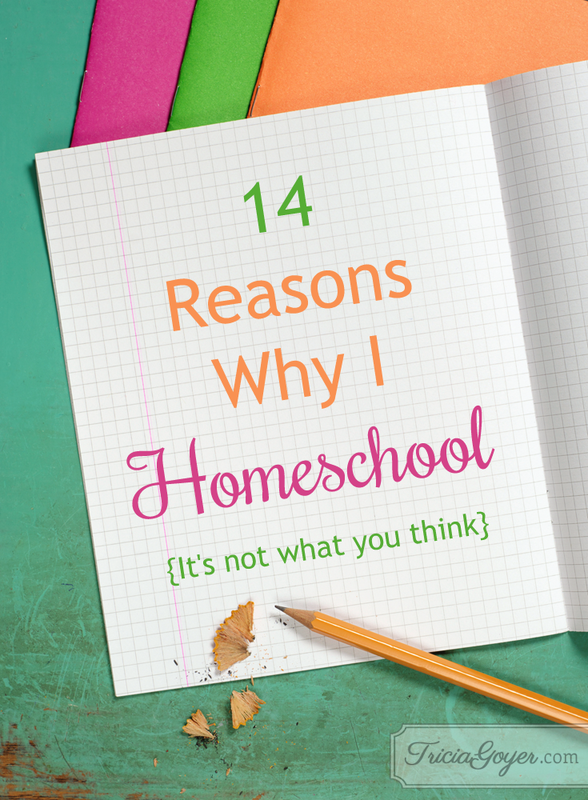 The homeschool expereince really does vary from family to family, and a huge part of it is the reason why the parents choose to home school. Some do not do so for good reasons—but Tricia’s here are wonderful! I loved reading them! Candance, three of my kids have graduated from homeschool and went on to college. My daughter received her Bachelor’s Degree when she was 21-years-old. My son wrote a novel when he was 20-years=old. My other son graduated from college and is married with kids and is doing great. Homeschooling helped me kids LOVE to learn and excel in life. I agree with you 100%. I share the same views and values you talk about here. We did do public schools. YES! Thank you for sharing these and starting my day off with great homeschool motivation. It is consuming and there are other things I could be doing, but it is so important to us and really such a blessing to my kids home all learning together. I agree with all your points, but #2 & #3 are always ones that I tell me are our biggest reasons to homeschool. Thank you for sharing, Tricia. We’re in our third year of homeschooling–and loving every minute (well, almost every minute…). 🙂 I was homeschooled for six years as a child and had a wonderful experience. I’m thankful to have the mom perspective, as well as the child perspective. We homeschool for all the same reasons you homeschool. It is a big sacrifice for us, as well (I just signed my third book contract), but I believe so strongly in my experience, and in the benefits of homeschooling, that I’m willing–eager–to make the sacrifice. My youngest just graduated from high school last year and was homeschooled all of the way through (along with her three siblings.) I would add one more thing to the list: my relationship with my child. Having them with me for the majority of the day, rather than sending them away from our home for seven or eight hours, has allowed us to spend so much more time together than if they went to public school. I truly knew my kids. Once, one of our friends asked one of my kids what they wanted for Christmas and their reply that we didn’t do wish lists for presents kind of shocked them. As I told her, we didn’t want Christmas to be about what was received, but about Jesus. Besides, I knew what my kids would like and there was never any disappointment when gifts were opened. While it was hard work, lots of prayer and mentoring can make the homeschool experience a rewarding experience. Constitutionchic, I agree with you completely. I would also add that after 10 years of homeschooling my now 7th and 10th grade boys, they have a strong sibling relationship. I noticed that when one or the other of my boys spend a lot of time with other friends w/o their brother, they are not as kind to one another than if they all are “friends” hanging together. By no means do I require that they always be together (they need time away from each other) but I know that they are better friends and brothers when they hang together. I love everyone of your reasons and I agree with 90% of them. I have just started homeschooling my daughter full time (she turned 5 in August) and most of my family do not agree with the decision. They say she needs to “live in the real world” and I can’t shelter her from “real life”. Well my husband of 26 years just died suddenly of a heart attack this past Friday. In the last 14 months I have lost a great aunt, a dog, a cat, an aunt (my mom’s only sister), my mom and now my husband. Through all of this my only child has been right there experiencing “real life” with me and not sheltered one bit. I believe because she has been home with me for preschool and pre-K, it has given her a much better basis to understand and deal with our situation right now. I am so thankful that I made the choice to homeschool (even before she was born). Now I don’t have to send her off to a teacher and a room full of children that don’t understand what she is going through, what she has lost and what see needs to continue to move forward. I can not imagine what kind of cruel actions would be inflicted on her by children that only see she doesn’t have a daddy. For myself and my daughter homeschooling was the only choice and will continue to be. It is not an easy lifestyle and especially right now for me to continue but I truly believe in my heart that it is the reason we will bond, grow and make it through as a family. Maria, your message brought tears to my eyes. I’m sending up a prayer right now! I’m thankful for the way that God has put homeschooling in your life to help you during this time. You are making a wise choice, friend! 1) I think they keep more innocence and remain more unspotted from the worldly teachings (Satan’s lies) in homeschool. 2) My children, God, my husband and I get to be in charge of all education decisions in our homeschool. 3) There are no school custodians or school cooks, which prompts me to teach them to prepare meals and clean. There are no slaves here. Everyne pitches in and does his or her part. 4) We get to sleep in and take our time getting ready for the day. We get to stay up as late as we choose to. We all get more sleep. 5) My kids get to play in the snow as soon as it snows (no waiting for recess or after school), get out and enjoy spring instead of cramming for tests all season, get to have Christmas for a month, and are not hyper and naughty in the summer because of being controlled 9 months of the year. 6) My kids are enjoyable for me to interact with much of the time because I am one of their big influences. They come to me for answers instead of trusting only in someone else, like their school teacher. They are bored less often and I am not the provider of entertainment for them. They can entertain themselves. They are one another’s closest friends. They learn to get along with each other and love each other. 7) I do not need tests to know whether my children understand or not. I know immediately. I can address the issues immediately. The kids do not stay frustrated longer than 5 minutes because they do not understand. I know they are frustrated after one minute–sometimes they just have to wait while I help a sibling of theirs! I love this, Lisa! YES! Love it! Spot on! I agree with everything on your list. My husband was probably sold more politically on it than anything…why send your kids to school to be indoctrinated with ideas and beliefs you don’t agree with and will have to fight off and undo. We still expose them to the other side, let them know that not everyone agrees with our beliefs, and let them know that some day, they will have to decide, but in the meantime, they are building a relationship with God that should help them immensely down the road. I was a public school kid, and then a teacher with a MA in brain development in the public sector for many years prior to having kids. When God started calling me to homeschool after my first was born, I consistently looked back at him with skeptical eyes and told him he’d obviously dialed the wrong number. NO WAY! And here we are, nearly three years into the journey and I’m convinced I’d never go back. My reasons are very similar to yours. I love the ability to be the one who gives feedback and input into my children. I love the ability to study what they are passionate about, and to do things in a way that honors their learning styles and pace. I love having them around, even on the days they make me want to pull my hair out. We’re friends – buddies! – and I pray it’s a relationship that will last our entire lives. It’s such a wonderful blessing! And I no longer worry about being “weird” as a homeschooling family… instead it’s a title we relish. We get to do everything with God at the heart – that’s exactly the kind of weird we seek to be! What curriculum do you use? I feel like the “getting started” is always the most intimidating and takes the most courage. I currently use Sonlight. I love it! Thank you so much for the list! All great reminders for days that the doubts creep in. 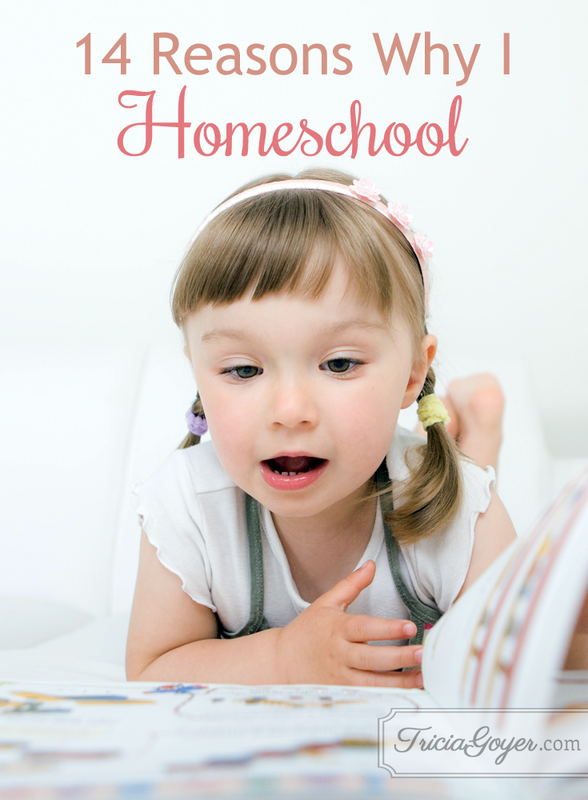 Since beginning our homeschool journey we have seen everyone’s quality of life go up. We don’t wake sleeping kids. We don’t rush. We eat well. We take time to enjoy each other and each new phase that life brings. I enjoy my kids’ company. I want more of it! not less. This was an interesting arcticle, thank you. My husband and I decided to homeschool our oldest after he had been in public school up to sixth grade. He was having behaviour problems at school and getting left behind academically, in a top rated school district. Our middle son is supposed to start Kindergarten this year my husband wants to homeschool him also but for some reason I am on the fence about it. I think I still have the stigma that going to school is still the norm. We had so many negative issues with our oldest son but I can’t but think what if our 5 year old would live it. I’m glad it was helpful! Maybe write a list of your hesitations? I know each family must decide their own path. Talking to your husband about your concerns–and his–would be a great place to start! I was a classroom(mostly Montessori) teacher for 22 years and I have an MA in education. My eldest son did a mix of Montessori and public. I home schooled him for the last two years of high school as an emergency to keep him from dropping out because he hated school so much by that time. I wish I had started much earlier. I started homeschooling my middle son in 9th grade and I cannot even believe he is the same kid. Where before he had very little social interaction (he has Aspberger’s) now he has many friends and has served as the president and vice president of our very large and active 4-H group. He even got voted best president in our county! And he is now preparing to go to college next year and is being courted by schools like Yale. He wants to be a mathematician. My five year old daughter has never been to school but is constantly around other people. She loves making things and taking them to neighbors. We belong to two co-ops and I teach in both. We volunteer regularly in our community and are active in our small Orthodox mission parish. She takes ballet and piano lessons. She is on track or ahead in all areas. So why do we home school? Because at this time it is still a legal choice and after experiencing every type of educational environment as a student, parent, and teacher I have not seen its equal in either socialization or education. All great reasons, with a kindred heart of my own! Thank you for sharing this! Hello, I’m in the midst of my 10th year homeschooling, first year of high school. I could not have written out a better list of reasons why we have chosen this for our family. You took the words right out of my heart! 🙂 Knowing you finished the journey a few times over is an inspiration and an encouragement. May God continue to bless your journey! I admire all of y’all so much! I am feeling like I should homeschool my daughter. I have always wanted to. I’m a single working mother and my daughter is doing well in school. Everyone has bumps here and there, but mostly it’s positive there. She’s 7 and I’m 1st grade right now. What are your thoughts on helping me to get over this hump to actually do it? I just want to make sure I do it correctly.